MADRID, Spain (CNN) -- French police arrested two suspected members of the Basque separatist group ETA, just days after Spanish Civil Guards arrested nine suspects, Spain's Interior Ministry said, according to CNN partner station CNN Plus. 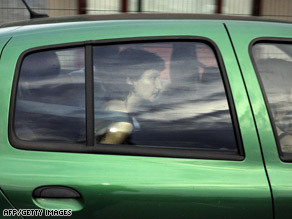 One suspect is seen in a police car Friday near Dijon, France. The arrests of the man and woman on Friday came after they tried to elude a police traffic control checkpoint near Dijon. The suspects were identified as Asier Eceiza, considered a top aide to a senior ETA operative still sought by police; and Olga Comes, whom authorities link to the ETA suspects arrested Tuesday in Spain, CNN Plus reported. That group is believed to comprise the most active cell since ETA officially ended its unilateral cease-fire in June of last year, Interior Minister Alfredo Perez Rubalcaba said. Police suspect that Comes participated in following the movements of a town councilman, Benjamin Atutxa, from the ruling Socialist Party late last year, and that ETA planned to kidnap and possibly kill him, CNN Plus reported. The 1997 killing of town councilman Miguel Angel Blanco of the then-ruling conservative Popular Party marked a turning point in public sentiment, many analysts say. The young councilman was held for several days and then shot in the head, prompting millions of Spaniards to turn out in the streets across the nation to protest against ETA. Earlier Friday, Spanish Prime Minister Jose Luis Rodriguez Zapatero said in a nationally televised news conference with visiting Venezuelan President Hugo Chavez that he had spoken with Atutxa to offer his full support. Like hundreds of town councilors in the troubled Basque region, Atutxa has a bodyguard because of ETA threats. The nine ETA suspects arrested on Tuesday were thought to be behind the May 14 car bombing that killed a Civil Guard member and wounded four others, Rubalcaba said at the time. Their other objectives included the planned kidnapping of the Socialist councilman, authorities have said. Days after the May blast, police arrested ETA's suspected leader, Francisco Javier Lopez Pena, and five other suspects in southern France, ETA's traditional rear guard base just across the border from Spain. ETA is blamed for more than 800 deaths in its long fight for Basque independence from Spain and is listed as a terrorist group by the European Union and the United States. In March 2006, ETA declared a "permanent" unilateral cease-fire, raising hopes for an end to nearly 40 years of ETA violence. But an ETA bomb at Madrid's airport the following December killed two men and caused heavy damage, and the Socialist government immediately ended the fledgling peace process. There are about 500 ETA convicts or suspects in Spanish jails and more than 100 more in French jails, authorities said.